ICE BATH CALIBRATION for Your Thermometers! 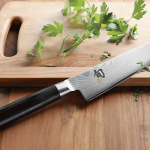 | The Perfect Steak Co. | The Perfect Steak Co.
Over time and as a result of drops and other kitchen mishaps, some thermometers (particularly dial thermometers) can become less accurate and require recalibration. Although digital thermometers like the ThermoPop and especially the Thermapen with its professional-grade thermocouple sensor should not need calibration over the life of the instrument, it is always a good idea to double-check the accuracy of your thermometers every so often. Here are a few scientifically-sound techniques for checking your thermometer to make sure it’s up to the task of taking accurate temperatures this holiday season. The easiest way to test the accuracy of any thermometer is in a properly made ice bath. If you do this carefully, your ice bath will be 32°F (0°C) within ±0.1°F. However, if you’re not careful, the ice bath can be off by several whole degrees. (A simple cup of ice water can be as much as 12°F [6°C] too warm.) Preparing a properly made ice bath is critical. Slowly add water to fill the spaces between the ice. Fill about 1/2″ below the top of the ice. Insert your probe (or thermometer stem) into the mixture and stir in the vertical center of the ice slurry. Your thermometer should read 32°F (0°C) in the ice bath. Important: It is important to know the manufacturer’s accuracy specification when performing a thermometer accuracy test. If your thermometer is within specification, you should not adjust its calibration settings. For example, the ThermoPop specification is ±2°F (1°C) over most of its range, including the ice point. If your ThermoPop reads anywhere between 30 to 34°F (-1 to 1° C) in your properly made ice bath, it is within spec and should not be adjusted. The Thermapen accuracy specification at the ice point is ±0.7°F (0.4°C). Boiling point calibration tests are trickier than ice bath tests and a thermometer that reads correctly in an ice bath will normally read correctly at the boiling point. You may not need to test the boiling point unless you have reason to suspect your accuracy at higher temperatures. Water boils at 212°F (100°C) only at sea level. Changes in atmospheric pressure at elevations above or below sea level alter the temperature at which water boils. For example, water typically boils at 202°F (94°C) in Denver, CO.
Fortunately for you, finding the boiling point where you live is easy. Check out our simple boiling point calculator to find out what temperature water boils where you are. Or, for a quick elevation reference consult the Boiling Point Altitude Chart. Fill a saucepan or pot at least four inches deep with clean water. Place the pot on the stove and turn the burner on high. Wait until the water comes to a strong, rolling boil that does not stop with stirring. As soon as the water reaches boiling point, put the tip of the thermometer probe a few inches into the water until the water temperature stabilizes. Cross check the temperature reading with the boiling point in your area and you’ll have a good indication if your thermometer is reading temperatures correctly. Adjust your dial thermometer as directed by the manufacturer. 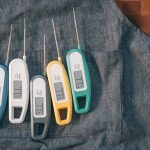 But before you attempt to adjust a digital instant-read thermometer, check that the readings are within the manufacturer’s accuracy specifications. (Look for a ±°F on the documentation included with the instrument.) Remember, if your thermometer’s reading is within the specified tolerance, don’t adjust. As a rule of thumb, it’s always a good idea to keep track of your calibrations to monitor the performance of the thermometer over a period of time. Misuse can cause the instrument to fall out of spec more often, and a record of temperatures may help you take corrective actions to preserve the useful life of the thermometer. Keep track of your calibrations with the ThermoWorks Temperature Logbook.